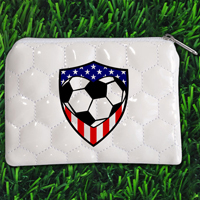 Show a special soccer fan how much you love them with a gift that expresses their passion for the game. 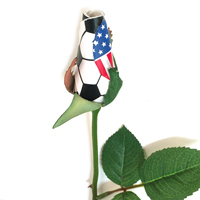 Each petal of the Soccer Rose™ is carefully handmade from genuine soccer material to form an unforgettable bloom that will amaze the soccer athlete, coach, or team mom in your life. 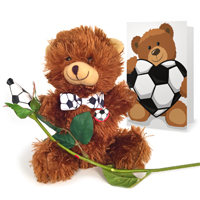 Personalized Soccer Roses™ can be imprinted with a short message (up to 2 lines) on one petal of the rose. There is a 15 character limit on Line 1 and a 5 character limit on line 2. This is a great way to commemorate a special occasion like a player name & number, birthday, wedding date, tournament name, or milestone achievement. Choose from 4 different print colors - Black, Red, Blue, or Green. The Soccer Rose offers a memorable way to honor any occasion. 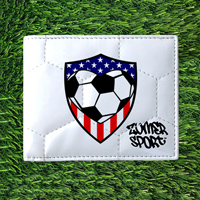 We carefully create each Soccer Rose by hand using our custom designed soccer material to form petals on an unforgettable bloom that lasts a lifetime. 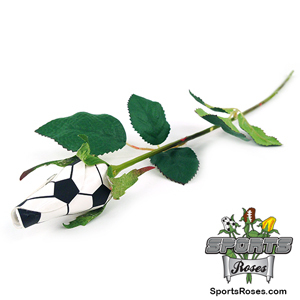 The Soccer Rose requires no watering and will never wilt or die, just like the passion any soccer fan has for their favorite sport. The artificial stem measures 24" in length and has a "life-like" quality that is hard to distinguish from live stems when arranged in a mixed bouquet with live roses. 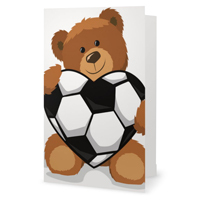 Cellophane Gift Arrangement: Soccer Rose individually wrapped in cellophane and accented with silk baby's breath and a 7/8" wide white soccer-print grosgrain bow. Clear Case Gift Arrangement: Soccer Rose individually packaged inside a clear plastic case and accented with silk baby's breath and a 7/8" wide white soccer-print grosgrain bow. Petal Personalization: Add a short permanent message to one of the rose petals (Limit 15 characters on line 1 and 5 characters on line 2). Personalization will be printed in ALL CAPS using Athletic style font to improve visibility. 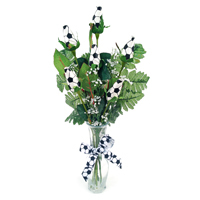 *ALL SALES ARE FINAL on Personalized Soccer Roses. View our return policy here.